Sailors representing three generations sailed “Centennial II”, copy of a 20-foot Gloucester dory that fisherman Alfred Johnson sailed solo across the Atlantic in 1876 to celebrate the country’s hundredth birthday. Accomplished sailors, boatbuilder Daniel Noyes of Newbury and Michael Long of Portland, and the old Closeteer, a lifelong water lover, made up the Centennial II’s crew. Michael 22, Dan 44, and the Closeteer 85 spent two fine days on the deck of Dan’s replica sailing in and out of the fog on the beautiful waters of Jericho Bay off Eggemoggin Reach among the islands between Arcadia National Park and Penobscot Bay. The Centennial II was launched on the Fourth of July last year. 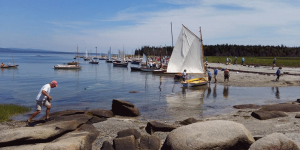 Built by Dan, the handsome dory of pine planks on oak frames, sloop rigged with 600 pounds of ballast, sailed well along with about 60 other small craft gathered for the Traditional Small Craft Association’s annual regatta out of Brooklin, Maine. Nights were spent in a nearby campground among spruce growing from thin soils perched on ancient ledge. The pretty boats were moored in a bay called Haven Brooklin. Motor launches took crews out to them each morning. About 100 souls, age eight to mid-80s, attended the event. Ninety percent of the talk between the many boat nuts was about the details of small vessel construction and their boats’ sailing characteristics. “Nuts” is unfair and doesn’t do justice to a subject that spans millennia in which a mammoth jargon has arisen. The Closeteer, a rower of dories, spent much time asking “What does that mean? Explain.” Ten years ago, he’d have kept his mouth shut not wanting to look like a greenhorn. Old age is a blessing in a way. Wanting to understand trumps ego. Dan and Michael patiently tried to explain the differences between lugs, sprits, yawls, ketches, etc. etc. They didn’t always succeed. In a discussion with an old guru of boat terminology, maritime museum curator and scholar Ben Fuller, the questions of “wherries” came up. Ben, a crackerjack teacher, tried his damnedest to describe vessels called wherries. The Closeteer never quite got it. Many definitions involve the history of where and when the words were used. At one-point Ben said the many fishing weirs of old were tended by wherries. Dan wryly suggested that weir might be the origin of the word wherry. Fuller wouldn’t buy it, but he and all of us chuckled at Dan’s play on words. This is an example of how the conversations went from morning to night. At sea the talk shifted to weather and the sailing qualities of the boats, many built by their owners. 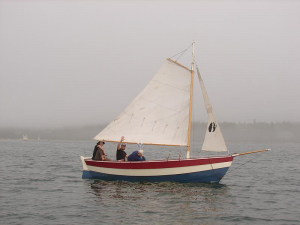 The Closeteer who has messed-about-in-boats since a boy and who later served on Navy ships has never been much of a sailor although as lads he and a friend built a sloop rig with leeboard for a skiff. His eyes at sea were too much on the scenery and wildlife and not enough on sail and rudder. Daydreaming was a factor too. He’d come up too high and lose the wind or fall off and lose the tack. Dan and Michael, long time sailors, seemed able to enjoy the views and to watch and feel the sails and tiller at the same time. They gently advised the old novice when things weren’t going right as he manned sheet and tiller. No marlin spikes or rope’s end were used on him during training. His instructors were not British man-o-war types. When things were going smoothly Dan would speculate on how to improve rigging and trim. Michael would pull out his ever-handy Patrick O’Brian novel and sink into its salty yarns. He didn’t sink far; a quiet word from Captain Dan or a feel of change in sailing had him back into the 21st century with the boat. In long stretches of quiet while sailing the Closeteer would ponder and inquire about the many variables involved. No wonder serious sailors are endlessly fascinated by their pastime. They must know something of weather, tides, currents, waves, depths, charts, winds, temperature, fog, and sea bottom types, in addition to the characteristics of their vessels. In the last half-century add to this list the use of electronic devices. If the old fashioned Closeteer had his way he’d foolishly do without the latter. GPS positioning for him takes the fun out of navigation. He as onetime ship’s navigator likes to tell tales of coastal piloting, dead reckoning, and star fixes with sextant and chronometer. The techies have carried navigation to a new level he hasn’t reached. On shore without cell phone, GPS or chart the Closeteer decided to hike around the perimeter of lovely Pond Island from a beach where the fleet was picnicking. He figured that with fair footing between the upper wrack line and the exposed seaweed at half-tide he’d make it in an hour, plenty of time to return to the resting sailors. Counterclockwise he circled carefully on stretches of ledges punctuated by stony beaches. Alone in the clear air with the sounds of cold clean water lapping on the shore, below lush vegetation above the tides, he was more than content. Happily, he found no manmade trash except for occasional lobster buoys that had escaped in storms. The great wonders of what turned out to be the three-mile, one and one-half hour hike, up down and around sea polished stones, were the stones’ diversity and beauty. Many seemed to have been sculpted by Jackson Pollock types working over hundreds of millions of years with the help of high temperatures and pressures. From the twists and turns in their products geologists would call them metamorphosed rocks. For moments the Closeteer imagined himself very wealthy and could afford to load the most interesting stones onto a barge and haul them ashore for placement around his mansion and in a friend’s funky rock garden. He wisely discarded such selfish thoughts as he called his friend’s attention to favorites finds. She was not there. He’d just have to tell her about them or better still row out with her in calm seas to see. He was glad he didn’t have a camera. Sitting on a couch pointing out photos without the smells of seaweed and the sounds of waves just wouldn’t do. He did return with images in his head not to be forgotten. Tired old legs faithfully had held out; feet hadn’t slipped. He rounded the island and regained the beach where Captain Dan and Michael were patiently waiting in Centennial II. The rest of the fleet had gone. On the sail home to the mooring the mountains of Arcadia were admired above a bank of low fog. Sailing lessons resumed but at a slower pace. All seemed right with the world after a week without radio, TV, or newspapers. The ghost of Alfred Johnson rose up from the cargo hold and sat silently among the Yankees of three generations on the handsome copy of his boat. He who had sailed Centennial I across the Atlantic alone for 67 days was happy to have company. *Danvers Water Filtration Plant, Lake Street, Middleton is the source for actual precipitation data thru June. 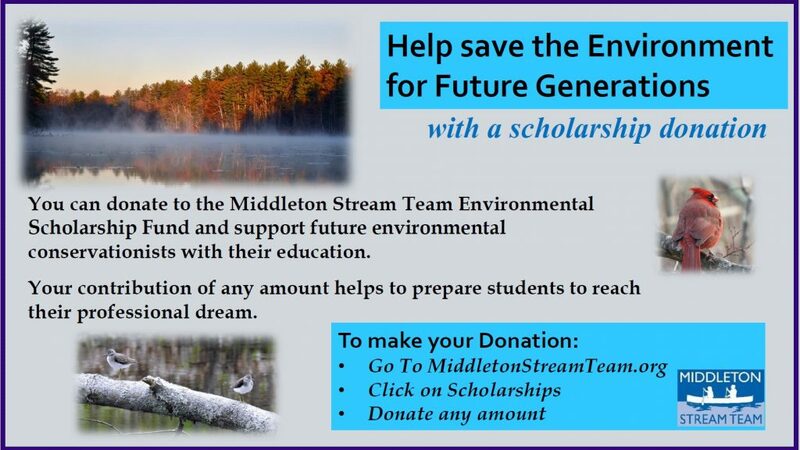 ** Middleton Stream Team is the source of actual precipitation data for July. Normals data is from the National Climatic Data Center. I felt right in your shoes, as an oldtimer (81) speaking to the younger generations. I also have to depend on new equipment (hearing aids). Last week I was at a day camp for youngsters teaching about nature, and in the evening we had a couple of moth nights. I wonder in your article, on para 2, did you mean ‘conservations’? Pike your amazing. I can picture it all in my minds eye. I sense your humbleness and and appreciation for the adventure and I am so glad you took this trip and shared it with us all.